Alonso the only man out on track but he soon returns after an installation lap. Meanwhile, Button's car is currently on the jacks with no front wing and a lot of work going on. Ominous start to his weekend. One of you just asked who else see this as there home race and I deleted it by mistake instead of publishing - the answer is Grosjean, as it's so close to France, but the list of Monaco residents here includes Hamilton and Button. Hi Nate, How are you? What's with Rain & Monaco? Expectation for sunday is wet as well? @rockedin123: Rain is forecast, yes, and there was some heavy rain overnight - hence the fact the drivers all went out on intermediates this morning on their first runs. We'll see what happens this weekend but rain certainly would add to the spectacle this weekend. Hamilton returns to the circuit. Merhi the only other man out there. Hamilton sets a 1:27.842, the first proper timed lap of the weekend. Nate, until the V8's dusk, there was not much talk about the engine power while RBR was literally dominating between 2010-13, do you think all those engine had same power? @rockedin123: It was more due to the fact aerodynamics had more of an impact before the V6 turbos came in. Red Bull has been very vocal in complaining how F1 has now become purely an engine formula, limiting the amount of work the likes of Adrian Newey can do to innovate. One cheeky question, do the drivers allowed to go home after the practices during weekends? @rockedin123: Absolutely. Rosberg said yesterday one of the great things about Monaco is that he can wake up, put on his racing overalls and head to the circuit. So what did you get Geri and Christian? @mfbull: An Audi key ring, but Christian didn't like it very much. The track is getting busier now and we have Ericsson on a flying lap. The track has dried out enough for soft tyres. @mfbull: I'm sure you'll have plenty of Carmen Jorda shots to make up for it this weekend. BTW who's Geri & Christian? @rockedin123: Christian Horner married former Spice Girl Geri Halliwell at the weekend. She was Ginger Spice in the 1990s. @Alberto: It's a rumour building a lot of momentum, yes, but it still remains to be seen how serious Audi is about it. They are fully committed to WEC and an F1 entry involves a lot of risk. Nate, does Maldonado's Lotus contract go till 2016, or does it cover only till the end of this season? @Phoenix: I don't think it goes beyond the current season. Ahhh, Carmen, so what's she like in real life? Did you get to touch her in Spain? I mean her hand, like in saying, "Hello." @mfbull: No, I wanted to keep my pass for the whole weekend! Woah there. Rosberg brushes the barrier at Tabac, looks like he gave it a bit of a clout but I don't think he's picked up any damage. @Stefan: The main strengths of the Red Bull in those days came from the aero package and, notably, the high-speed corners. They've lost that now. RB with a new Audi engine would probably have the same kind of season as McLaren are having - so what would the difference be? @Bjorn: That's one of the risks Audi would have to consider if it entered now. Ricciardo currently P2 but some four seconds down on Hamilton's first soft tyre run - the track drying out so expect to see the times close up now. @rockedin123: Senna went straight home after he binned the car while leading, and Kimi once went to a friend's yacht after a shunt. Rosberg back in the garage after that light tap at Tabac. Not too much concern at Mercedes so can't imagine there's much damage. Ricciardo has narrowed Hamilton's lead down to 1.686 seconds. Nice :P although, judging by his driving in Spain, he could be a pretty decent driver if he didn't crash much. Raikkonen has a little wobble through Tabac and he's complaining about a lack of front grip. 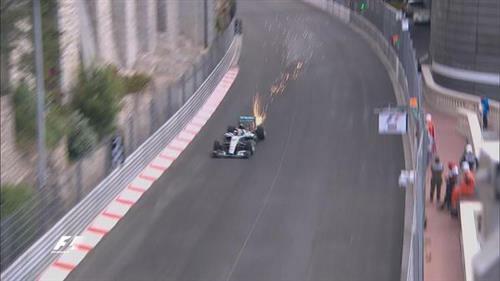 Rosberg is back out on track after that early meeting with the wall at Tabac. Seems like Bottas has run a little wide at St Devote. Hi Nate, have you heard anything more about the deal between Philip Morris International and Ferrari? Nothing more than we reported last week. The deal has extended until 2018. Philip Morris has not had clear branding on the car since 2008 due to the Tobacco advertising ban. Remember, the link between the parties is strong as Maurizio Arrivabene was a former marketing executive at Ferrari. DO you think the option of Tyre choices add some spectacle? Don't you think the teams will start copying each other if a pattern gets set?? @rockedin123: To be honest, I don't think that would do much to liven up the spectacle. At a glance it looks like it will but teams will just work out the fastest option for each grand prix - meaning most will still converge on the same solution. For example, no-one is going to pick a super-soft tyre in Malaysia even though it would be quickest. It wouldn't last a handful of laps in the heat there.